Students require excellent communication skills in their business and academic lives. 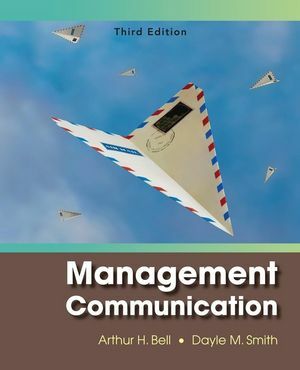 Management Communication is a step-by-step guide for learning specific techniques to help them improve those skills and achieving clarity and brevity in business writing. The authors follow a four-part approach to communication instruction: explain it, try it, evaluate it, perfect it. They provide graduate and undergraduate students, managers, and managers-in-training with the tools they need to become masterful communicators. The new 3rd Edition has a greater focus on “strategy through skill” and provides more opportunities for applying skills and insights to a broad range of fields for success in future careers in accounting, finance, marketing, management, information systems, telecommunications, and HR. Arthur H. Bell is Executive Director of MBA Programs at the Masagung Graduate School of Management, University of San Francisco, where he is also Professor of Management Communication. He holds his PhD in English from Harvard University and is the author of 49 books on a variety of management, communication, language, and literature topics. Among his most recent books are Winning with Trust in Business, with R. Cohn (Pelican, 2008), Butterflies Be Gone! Banishing Speaker's Nerves (McGraw-Hill, 2008), and You Can't Talk to Me That Way! Stopping Toxic Language in the Workplace (Career Press, 2006). Dayle M. Smith is Professor of Management and Director of the Honors Program in the School of Business and Professional Studies, University of San Francisco. She holds her PhD in Organizational communication from the University of Southern California. She teaches undergraduate, MBA, and Executive MBA classes in Leadership, organizational behavior, teambuilding, and human resource management. She is the author of many books in her field, including Women at Work: Leadership for a New Century (Prentice Hall, 1999) and Learning Team Skills 2e (Prentice Hall, forthcoming 2009). New section on social networking communication. The rapidly emerging communication phenomena of FaceBook, Myspace, and other social networking sites are explored. Use of this technology for business and marketing purposes is discussed in depth. New section on the electronic career search. Students learn the latest ways to develop resumes that are “searchable” by key terms, make use of career databases, and write cover-letter and follow-up communications that give them the edge in the job search. New material on the almost universal phenomenon “speaker’s nerves”—perhaps the single greatest enemy to progress in professional speaking—and how to overcome it. "Explain it-try it-evaluate it-perfect it" approach which stresses an active rather than passive approach to learning. Targeted help for international students - An entire text section has been developed to assist non-native speakers of English in their efforts to produce readable, well-edited college work. Communication Dilemmas feature - These recurring feature boxes across chapters pose interesting, real-life communication choices and challenges--gems for class discussion and writing on what can I say, what should I say, and what will others say, among other questions. “Meet a Management Communicator” - These six brief interviews, distributed among chapters, give students a chance to meet real men and women who communicate professionally in a variety of corporate environments. Communication Choices feature boxes - Pose communication challenges for which the reader must choose an appropriate communication medium: Do I send an email? Leave a voice mail? Call in person? Write a traditional letter? Send a fax? These kinds of crucial communication choices are not treated by competing texts. Linked features on Candor and Communication - These anecdote-based features make the point that truth-telling, authenticity, and transparency are must-have skills for every business communicator.